4" White Gauges and 5" Black Gauges Are Here! June 9, 2014 - 4" gauges with white faceplates and 5" gauges with black faceplates are now available to complement your boat's instrument panel. Select your preference at checkout! 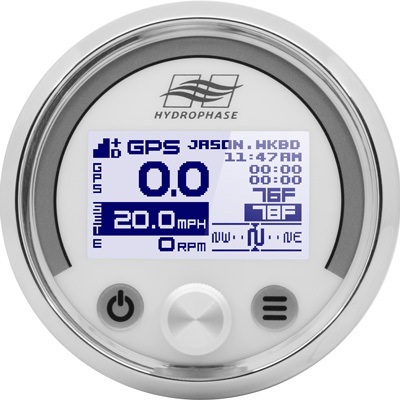 [AUSTIN, TX] June 18, 2013 — Hydrophase (http://www.hydrophase.com) today announced the launch of its flagship model, the GPS and RPM -enabled Ridesteady boat speed control system. [AUSTIN, TX] April 8, 2011 — Hydrophase (http://www.hydrophase.com) has announced the launch of its Ridesteady boat speed control system from wakeboarding hotbed Austin, Texas. Designed specifically for the wake sports community, the Ridesteady speed control system incorporates features not found in other systems, including speed-over-water technology, overshoot control, a one-second startup time, real-time lake temperature readings, and other items that address the particular needs of wakeboarders.